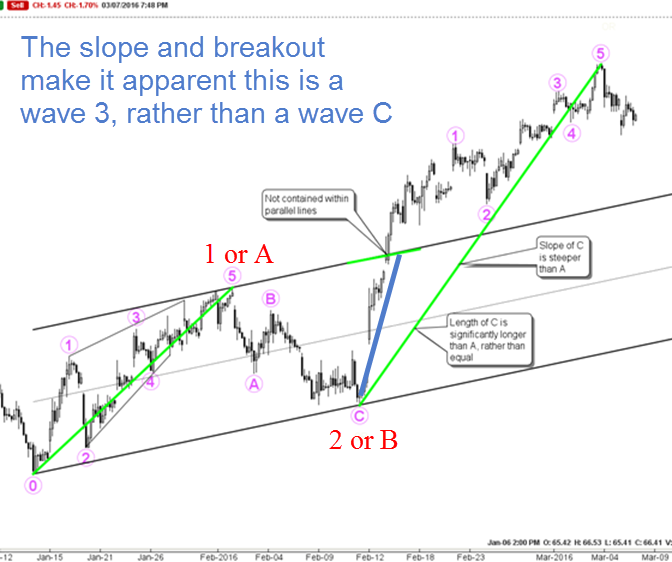 Wave A is most commonly steeper than Wave C in a Zigzag. If you see a steep start to Wave A, think Zigzag. Wave A and C will alternate between being sudden and sharp, without defining waves, and well defined. If wave A is a "screamer" you can expect wave C to be well defined and shallow, and visa versa. Because of the 5-3-5 wave structure of a Zigzag you will often be placed in a situation of having to differentiate a Zigzag from a 1,2,3 wave count. Getting it wrong has some serious repercussions. 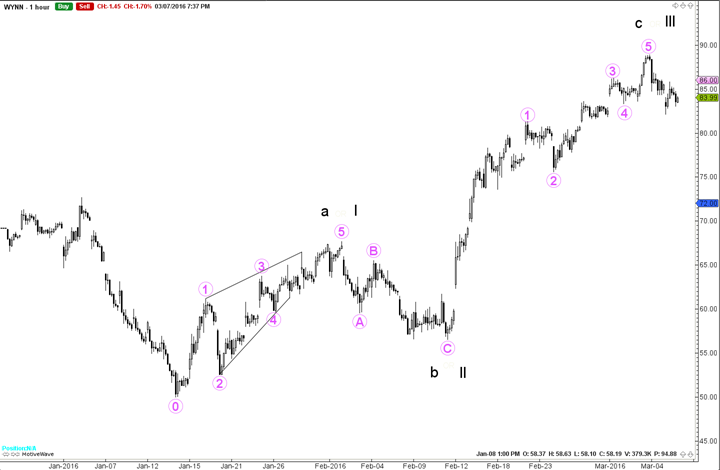 The chart below raises the question of whether an impulse wave or a corrective wave is developing. While no single guideline you can apply will predict the answer, when using multiple guidelines it is possible to determine which is more probable. Corrective action is typically contained within parallel lines. This is not. Wave A and Wave C tend toward equality. They are significantly different here. Wave C is typically more shallow in slope than wave A. It is steeper here. Again, while no single one of the above guidelines is determinative, and all three could be wrong, the fact that this chart violates each of the guidelines for a corrective wave, makes it more probable that we have a 1,2,3 structure in the chart. in a Zigzag, If Wave B reaches beyond .768, you have likely already finished the ABC correction and are now in your next impulse wave. Since we anticipate that WA = WC, once Wave 2.A is in, the Wave 2.B pivot can be estimated by transferring the distance of Wave 2.A to the .618 total expected retracement. Draw a trend line from OA to A, transfer it so that the end is at the .618 retracement. The other end approximates where Wave 2.B can be expected to pivot.